Shaker Square lies between the world-class cultural, educational and health care institutions on Cleveland's east side and the inner-ring suburb of Shaker Heights. It is on Shaker Boulevard, the main east-west road in Shaker Heights. Cleveland meets Shaker Heights a block east of the Square. Though it is within the City of Cleveland, it is in the Shaker Heights School District. That arrangement was made nearly 100 years ago to let city officials send their children to Shaker Schools - and it is still a reason why many city employees and officials live near the Square. For an interactive version of the above map, click here. The Square is divided into four quadrants by Shaker Boulevard (Ohio 87) which runs east-west, and by North and South Moreland Boulevard which enter the Square at the north and south. Each quadrant has a building with stores and restaurants and offices on the second floor. Metered parking is available. Sorry, but without them all the spaces would be used by RTA riders. Metered spaces are in gray on the map below. 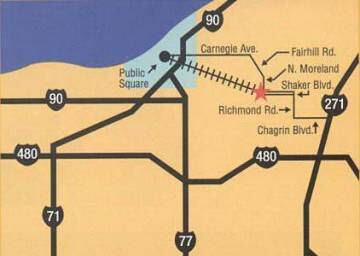 The meters along Shaker Boulevard are owned by Cleveland and cost $.25 per hour, with no charge Saturdays and Sundays. The meters around the Square and behind the northwest quadrant are operated for the Coral Company by a parking service. They cost $.25 for 20 minutes. There's a new walkway through to Shaker Square, so you don't need to walk to North Moreland. It is to the right of the CVS drivethrough window. This lot is behind Shaker Square Cinemas and Dave's. Enter this lot from Drexmore Road. Many spaces are marked "Daves" but there are plenty of other spaces. If you are driving east to the Square on Shaker Boulevard will find it very convenient to enter this lot from Shaker Boulevard. Valet parking is available at Fire, Sasamatsu and Sergio's Saravá restaurants. Some restaurants pay for it. Visit Yahoo Maps or MapQuest. Enter your "from" address and the address of your destination. If you don't have use of a car, getting here by cab makes sense, particularly in the evening and on weekends when public transportation runs less frequently. Cab fares to Shaker Square. Taxi fares in Cleveland are set by the City of Cleveland and are the same for all companies. There is no extra charge for the first four passengers. The estimated fares below were furnished in February 2009 by some local taxi companies. Note that in Cleveland, taxi meters compute the fare based on mileage, plus waiting time. These estimates include a gas surcharge and sales tax but do not include tip.